On the Mike has been on a hiatus here in Tri-City – lotsa of stories, but minimal time – due to the lack of internet capabilities (no internet at the press box, no internet during the day at the hotel (hence the 4 a.m. posting). We will have some video from the final day in Spokane, video of the hotel room here in Kennewick, along with some news on the newest members of the Hawks when we get home. Plus, our best-of segments – including place to call a game, best hotels, best fans, best stadium. With their 4-2 loss tonight to the Spokane Indians, the Hawks have been officially eliminated from the postseason race – even though HAM Insider, Mike Sharp probably thinks that both Boise and his Mets still have a chance (even though Tri-City’s magic number is zero). We will have more on our final day in Spokane later tonight (including another Best Of and a look at a sold out Avista Stadium), but instead of focusing on the negatives, let’s look at something completely different – Hawks Alumni. 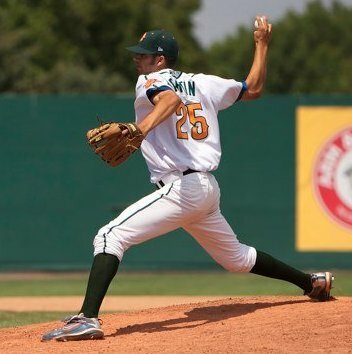 The following document has a list of all former Hawks that are currently playing professional baseball – from the major leagues, the minor leagues, and independent ball. Let’s get a win to close out this series!!! It’s time for the year in review segments – the Best of the Northwest League, since we have now visited each of the cities in the loop. PRE-GAME MEAL: The pregame meal is one of the more important things for a broadcaster – since we have to eat earlier than most folks in the press box (especially me, since we have a one hour pregame show). 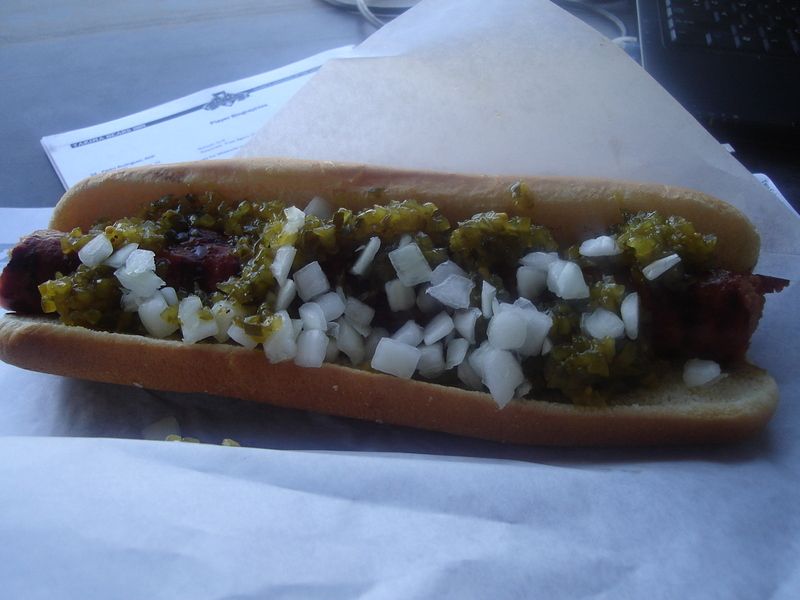 Food around the league is good, but the food at County Stadium in Yakima stands out. Maybe it is the staff at their BBQ pit and the fact that they take chances with me (a 1/4 hot dog with a philly-beef sandwich crammed in it, or a chicken bacon ranch sandwich with a drink mixture of lemonade and root beer). Whatever it is, it definitely is at the top of the bunch. Just behind Yakima is Spokane, who has my healthy kick – the Teriyaki Chicken bowl, although their BBQ chicken sandwich is also very good. I would also have to put the food in Boise in the Top-3 – although after 32 home dates, Pizza and Chicken Wraps do get old. My Rankings – 1. Yakima (absolutely love the Philly-Beef, the Chicken Strips, the 14-inch hot dogs, and the best fries in the league); 2. Spokane (teriyaki chicken at the ballpark is a must); 3. Boise (upgraded pizza this year is fabulous, cheeseburgers and fries are nice, as are the sno-cones); 4. Eugene (nothing like potato salad, peanuts, and Hometown Heroes…only place we got corn dogs in the booth); 5. Vancouver (chicken strips and fries are good, loved the popcorn in the booth); 6. Everett (although we weren’t there, I like the hot dogs and Tall Tom’s popcorn in the big bowl); 7. Tri-City (they tried to wow me with a pulled pork sandwich, but had trouble with the flat diet coke in the jug); 8. Salem-Keizer (once again, flat soda and either a small hamburger or hot dog – wish they would have had something from their Healthy Hut, which looked goot). BEST MASCOT: I guess I really liked my time in Yakima – as once again, the No. 1 spot goes to the Bears mascot, Boomer. 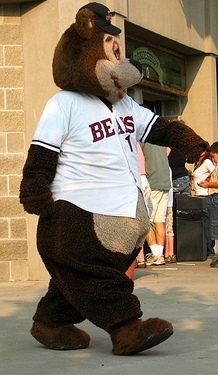 Maybe it is because Boomer is involved in everything that goes on at the park…greeting fans coming in, involved in all promotions, involved in all of their marketing, or just the fact that my son connected so well with “Boo-Boo” that Boomer had to at the top. The silver medal goes to the tandem of Dusty the Dust Devil and Erik the Peanut Guy in Tri-City – especially after the club got a new Dusty outfit which looks good. 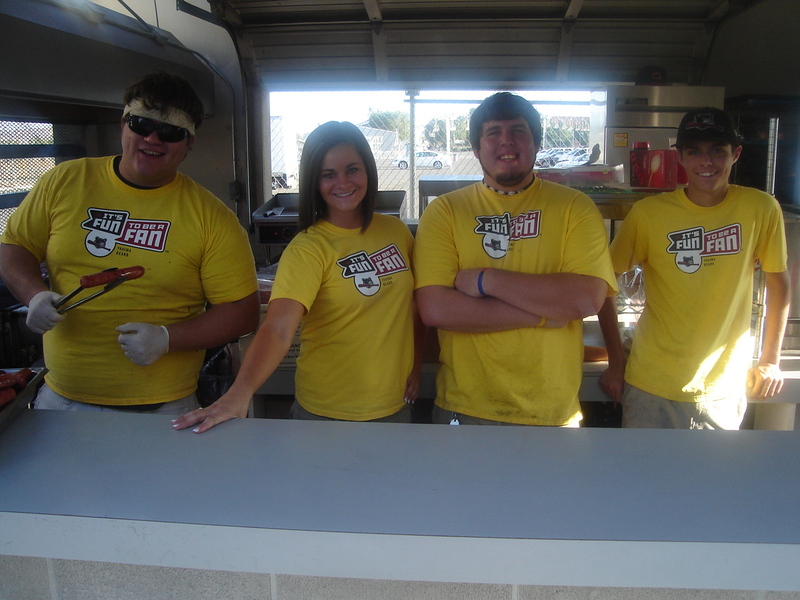 Erik steals the show, handling all of the on-field promotions while handling his peanut duties. Humphrey has to be in the Top-3 as well – with Rex on the field doing a great job this year. Humphrey loses points, however, for walking in front of the radio booths on numerous occasions, making it tough for me to call play-by-play (luckily, I have the Fiberpipe stream, which the visitor booth doesn’t have). STREAKS CONTINUE: Tonight was a tough game for the Hawks, managing just four hits in a 7-1 loss to Spokane. However, the four players with the longest hitting streaks on the team each recorded one hit – with Logan Watkins’ eighth inning single extending his streak to 17. Bobby Wagner pushed his hit streak to 12 with a double and scored Boise’s lone run, Hak-Ju Lee slapped a single to extend his streak to a season-high nine games, with Greg Rohan’s single in the second pushing his streak to eight games. POSSIBLE BULLPEN TROUBLE LOOMING: With only 13 active pitchers on the roster (since two pitchers have left during the trip), David Rosario will be hoping for quick innings the next couple nights. Jon Nagel is able to only throw three innings tomorrow, with the Hawks needing Yohan Gonzalez to toss three innings of relief – if it doesn’t happen, trouble could loom ahead, as Andres Quezada, Danny Keefe, and Trey McNutt unavailable, with Corey Martin and Josh Lansford most likely not slated to pitch until Friday at the earliest (due to work earlier in the series). That would leave Ryan Sontag and Dionis Nunez to finish things up – with Friday still seeing Quezada, Keefe, and McNutt not available, leaving Martin and Lansford to try and finish Chris Rusin’s start. ANOTHER SLUMP BUSTER? : We tried everything tonight to break the slump – I shaved my head and my goatee, leaving only a mustache (which Jon Nagel was envious of), with Gary Van Tol hitting infield/outfield prior to the game. We need some ideas for breaking the slump, with Tri-City’s magic number just 2 to eliminate the Hawks (I though having pitchers take BP)? 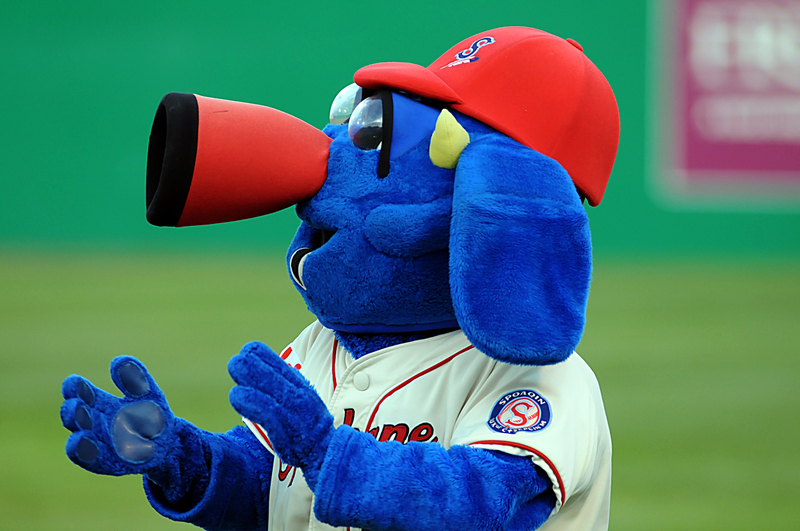 With the Spokane Indians drawing more fans than any other Northwest League franchise again this year, the throngs of fans are entertained each night by one of the more unique mascots in the NWL – Otto (pictured left, courtesy of the Spokane Indians), the Spokaneasaurus. Yes, a Spokaneasaurus – the one and only Spokaneasaurus in the world. Otto is very animated throughout the game and keeps the crowd entertained, along with one of the loudest on-field promoters in the league – Jaime has a great voice. GOTTA LOVE THE HOTEL: There was a time when the NWL teams stayed in downtown Spokane, which gave the players and staff a chance to explore Riverfront Park, the site of the 1974 World’s Fair. 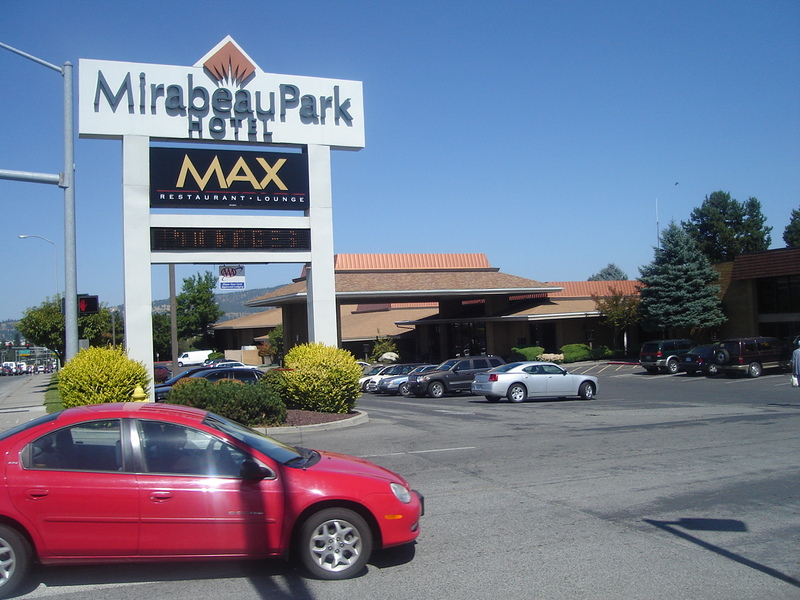 However, in 2005, the team moved out to Spokane Valley, east of the ballpark to the Mirabeau Park Hotel and Convention Center – one of the top digs in the league. Not only are the rooms spacius, but dining options for the players are close to the hotel – including Hooters, Sharis, Subway, McDonalds, Wendy’s, Taco Bell, Panda Express, along with local eateries. SPEAKING OF FOOD: The Indians staff has really been kind to the Hawks staff and to me each day – as the coaches have received an array of food after the game – hot dogs with peppers and onions, big cheeseburgers, and chicken sandwiches, while I have had my staple of the Spokane summer, a teriyaki chicken bowl (picutred left) – one of my favorite dishes in the league and one of the healthiest. However, for everyone to get to and from the clubhouse, one must take one of the more interesting walks in the entire league. 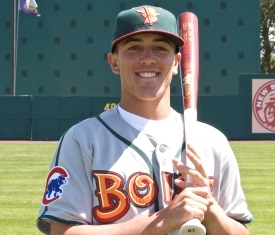 ROHAN HEATS UP, HIT STREAKS CONTINUE: Although the pennant chances for the Hawks took a big hit with the 6-4 loss last night to Spokane, it showcased the Boise bats. Greg Rohan had his second-straight two-double night and has recorded four RBI in the last two games. Bobby Wagner has at least one RBI in four-straight games and extended his hit streak to 11 with a first inning single, while Logan Watkins had his third double in two games, extending his hit streak to 16 – a season high. WHITLOCK BACK TO PEORIA: Following the game last night, the Chicago Cubs promoted right-hander Josh Whitlock to the Peoria Chiefs for his second stint in the Midwest League this season. Whitlock, who got off to a rocky start this season with the Hawks, had an outstadning last month of the year, allowing just two earned runs in 16 innings of work during August. Usually this blog is very light – talking about how the Hawks won or loss, the fun the team is having on the road, the food we get and how good or bad it is. That part of the blog will come later – but I need to be serious for a moment. One of the truly good guys to come through Boise over the years, Darin Downs, needs all of the prayer and support of Hawks fans. 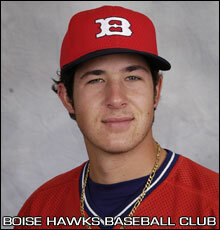 Downsy pitched for the Hawks as a second-year pro in 2004, helping the team to the NWL pennant, winning Game 1 of the Championship Series, and went on to pitch part of 2005 and 2006 with the club. After spending 2007 in Daytona and part of 2008 in Tennessee, he was released by the Cubs – only to be picked up by Tampa Bay, where he went 12-4 with their High-A affiliate in Port Charlotte, Fla. Just a week ago, he was promoted to AA Montgomery. In just his second start at the AA level last Monday, a line drive by a Birmingham player hit Downs on the side of his head – fracturing his skull. He was in the ICU at St. Vincent’s Hospital in Birmingham through the weekend – and according to news reports, he is slowly making a recovery. After seeing the video of Hiroki Kuroda of the Dodgers sustain a similar face, it just puts a pit in my stomach to know this could happen to Downsy. I’d ask that you send an email to Montgomery’s broadcaster, Jon Laaser at jlaaser@biscuitsbaseball.com and he should be able to get the note to Darin, his fiancee, and his family. Lets all hope for a speedy recovery for the lefty! 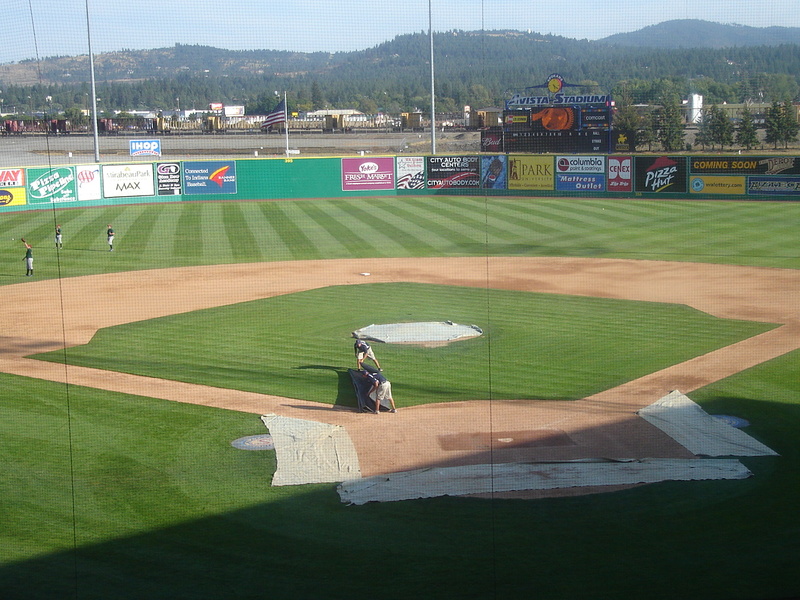 A NIGHT TO FORGET: Riding high after 12 wins in 16 games and jumping out to a 3-0 lead in the first inning, everything was pointing toward another Hawks win, however, Spokane had other ideas – rapping out a season-high 18 hits in a 14-5 wholloping of Boise. Tommy Mendonca, the stud third-baseman out of Fresno State had four RBI, including a mammoth home run off of Robert Hernandez in the first inning. The Hawks were their own worst enemy, leaving runners in scoring position in seven of the nine innings tonight. IN RARE COMPANY: Logan Watkins is joining baseball’s elite this summer, extending his hit streak to 15 games with two doubles – his second 15-game hit streak of the year. What is astounding is that he is the only player at the short-season level to accomplish the feat, and one of only four players in all of Minor League Baseball to accomplish it (including current Cubs outfielder Jake Fox and Iowa Cubs outfielder Brad Snyder). Bobby Wagner had a homer and two RBI in the game, extending his hit streak to ten games. THE GROTTO: I always thought that the Hawks should move the Hawks Nest out near the scoreboard and make it an eating area where you could get a home run ball. 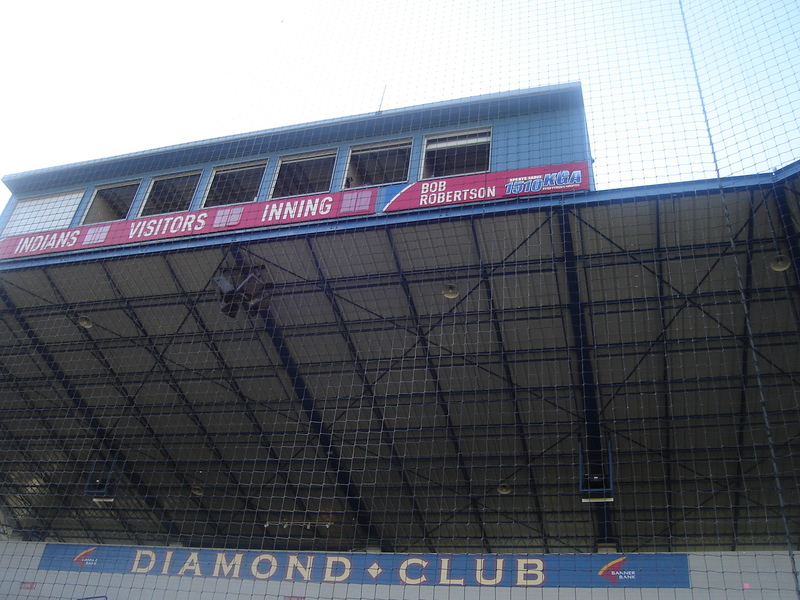 Spokane has done that with their right field pavilion, the Grotto (pictured right). Fans can sit at picnic benches, kids can play in a kids area, and it is right on top of the action – as the view is outstanding. 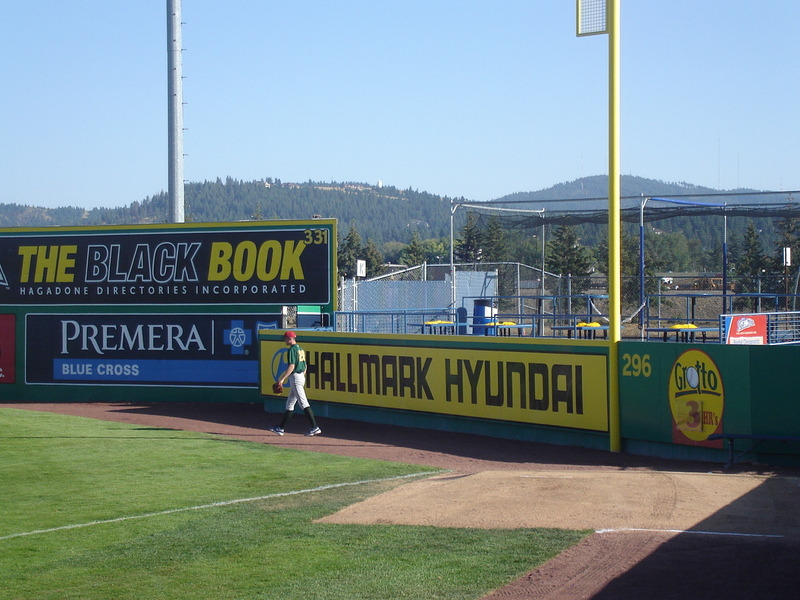 As you can see in the picture, where “The Black Book” sign is, will be the Indians version of the Hawks Nest, a full restaurant with views of the field – lowering the wall to just six feet, making it even more of a home run hitters paradise. Typical minor league day for the Hawks – wake-up call at 8, on the bus by 9, arrive in (blank) at 1, head to the park at 3, play a game, win, head back to hotel. The details in between were definitely good, as Boise moved to 3-1 on the road trip with a 4-3 win over Spokane. 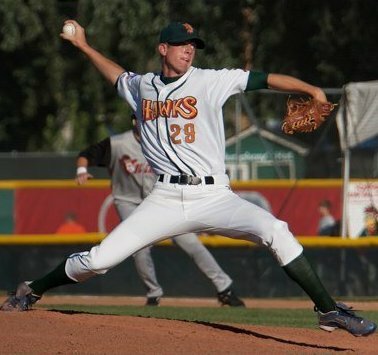 After jumping out to a 4-1 lead, thanks to nine hits in the first three innings, the Hawks turned the game over to the pen – especially Corey Martin (pictured left). The kid from Western Carolina was outstanding, allowing just one walk and one hit in three innings, stranding the tying run at third in the seventh and at second in the eighth, then working a 1-2-3 ninth for the win (I had Martin with the save and Josh Lansford the win, but the official scorer said that Martin was more effective in relief – thus getting the victory). matheusGem.wma), who made a long, side-arm throw from deep in the hole at short to get the first out of the ninth inning. 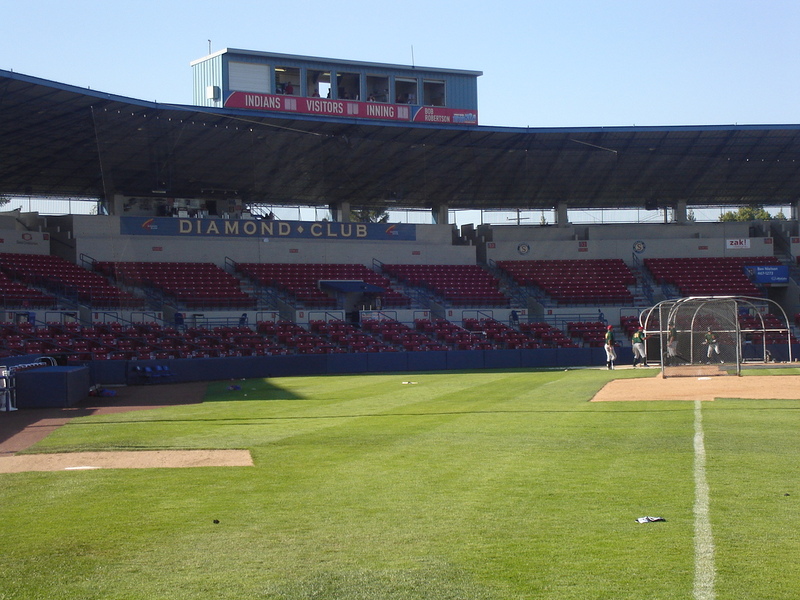 SPOKANE THROWS OUT THE WELCOME MAT: Always known as the gem of the Northwest League, the Spokane Indians once again outdid themselves as an organization on the opening day of the series at Avista Stadium (pictured left) – not only having a fully stocked refrigerator in the coaches office, but also feeding the team after the game – something that the fellas truly appreciated. 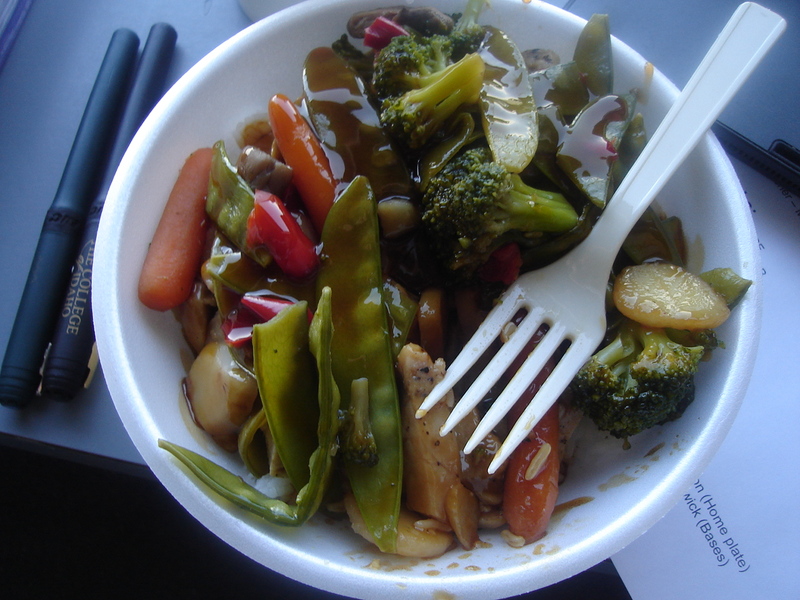 From my standpoint, they also took great care of me – getting me one of my favorite meals in the league teriyaki chicken and vegetables for dinner. THE LONG WALK TO THE BOOTH: The opening day at Avista is always a long haul for any visiting broadcaster, as you must degociate three different flights of stairs to get to the booth, situated high atop the ballpark (pictured right). (To see the last set of stairs and your first video look at the park, click here). The vantage point is the best in the league – and the crowd tonight was outstanding (4,915), the second largest crowd the Hawks have played in front of during the 2009 season. THE BACON: With the win last night, the Hawks have won 12 of their last 16 games, pulling themselves within two games of .500 with 14 games left in the season – the closest they have been to .500 since June 21…Boise will lose a pitcher tomorrow, as Su-Min Jung will leave for Korea – as Eduardo Figueroa will take his place in the rotation, starting Tuesday night. Check Yakima of the lists of cities for the Boise Hawks, as the club used a big sixth inning two-out rally to stop Yakima, 10-3, before the largest crowd in County Stadium history. The day started with a team lift at the local YMCA, which saw me run for 40 minutes while watching the World Track and Field Championships – boy are they fast. Following the workout, the fellas were in the gym playing a game of bump – they wanted Hak-Ju Lee to play (calling him Yao), but he chose not to. Matt Williams won the imprompto game – although I was most impressed by Corey Martin’s jumper, and the skills of Ryan Sontag and Eduardo Figueroa. With a weekend pregame show, I was able to get on the field and take a final 360-degree look at County Stadium for you in Boise. The game was a fun one, the Hawks jumping out to a quick lead, giving it up, then erupting with two outs in the sixth, getting a bases-loaded walk, a wild pitch to score a run, a two-run Bobby Wagner, and an RBI single from Richard Jones to push a lead to 8-2. 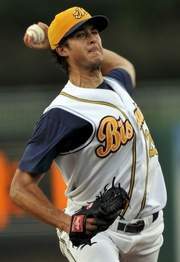 Jae-Hoon Ha had three hits, Wagner drove in three, while Logan Watkins not only extended his hit streak to 13, but had a pair of unassisted double plays – including one to end the game on a wierd infield fly rule call. NO-NO: Tonight also marked the first no-hitter in the Northwest League since 2007 and the first nine-inning no-hitter since 2002, as Salem-Keizer blanked Everett, 8-0. The Hawks have never thrown a no-hitter, but have been on the short end of a perfect game against Tri-City in 2001. CHECKIN OUT: The team will check out of the hotel in Yakima at 9 a.m. tomorrow, heading 200 miles east to Spokane to open a six-game series with the Indians. The Hawks head into the series 2-1 on the road trip, having won four series’ in a row, and once again three games below .500, sitting six games behind Tri-City in the East. Fans, here is a ten-spot of Hawk Talk Interviews that I have conducted with players from mid-July to mid-August that were named Ram Tough Player of the Game the previous night. Each of the interviews is roughly 2-to-3 minutes in length and discuss their role in the previous night’s game and a bit about their baseball journey. 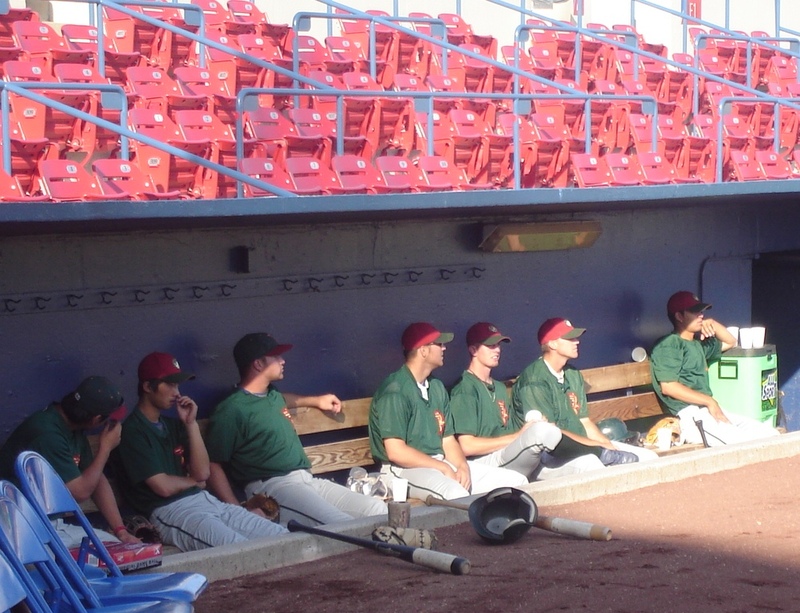 Talk about a tough way for the Hawks to go down to defeat – battling back after being no-hit through five innings, taking a lead in the 10th, but watching the bullpen, which has been so good over the last month of the year, blow a two-run lead in a 4-3 loss to Yakima. Was is more disheartening is the Hawks squandered a chance to pull two games under .500 and pull five games behind first-place Tri-City. Robert Whitenack (pictured left) did his job, recording his best performance of the season, going six innings of three-hit ball, allowing just one run and one walk. Boise tied it in the sixth on a two-out RBI single by Logan Watkins, extending his hit streak to 12, then took the lead in the 10th on a D.J. Fitzgerald RBI groundout an a Matt Williams RBI single. But it didn’t last long, as Dionis Nunez gave up a double, sandwiched around a pair of walks, and Ryan Sontag didn’t fare much better, allowing a run on a walk, a ground out, and the winner on an RBI single. FROM THE FIELD: The dimensions of the park are quirky – although we’ll see more strange ones in Spokane later in the trip. During batting practice today, I walked into the left-field corner to give you a birds eye few of the corner (with the 293 foot foul poul), and nearly got picked off by a Jose Guevara liner. What you will also notice is the sloping field in right (look closely and the bottom of the wall and how the signs stay straight, but the blue portion of the wall grows, and grows and grows. AUDIO CLIPS COMING: Tomorrow, we will post the ten latest Hawk Talk interviews with the players – ranging from mid-July to mid-August. A six-hour bus ride and 105 degree temperatures welcomed the Boise Hawks on the annual Western Idaho Fair trek through the Northwest League, as the Boys of Summer opened their exodus in Yakima tonight. A potent offensive attack and a summer lightning storm (pictured left) proved to be the highlights in a 9-3 Hawks victory. The win propels the team to a 28-31 record, the first time since June 22 that the Hawks have been three games under .500, with Boise sitting six games back of Tri-City in the standings with 17 games left. The Hawks have now won ten of their last 13 games. Boise had a season-high seven doubles, part of a 16 hit attack in the win. Jae-Hoon Ha had a pair of two-run doubles, while both Jose Valdez and Hak-Ju Lee recorded three hit games. The star, however, was on the mound, as Trey McNutt tossed three and two-thirds innings of shutout ball, allowing just one hit and striking out two. 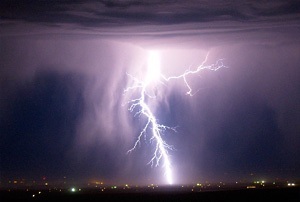 FLASHES IN THE HILLS: Starting in about the sixth inning, a huge electrical storm gathered on top of the Yakima Ridge – about 15-20 miles east of County Stadium – in plain view over the outfield wall. Although the Valley was in no danger to the storm, it was a spectical for all – and possibly the highlight for Bears fans. What was nice was the wind from the storms helped cool down the muggy night. 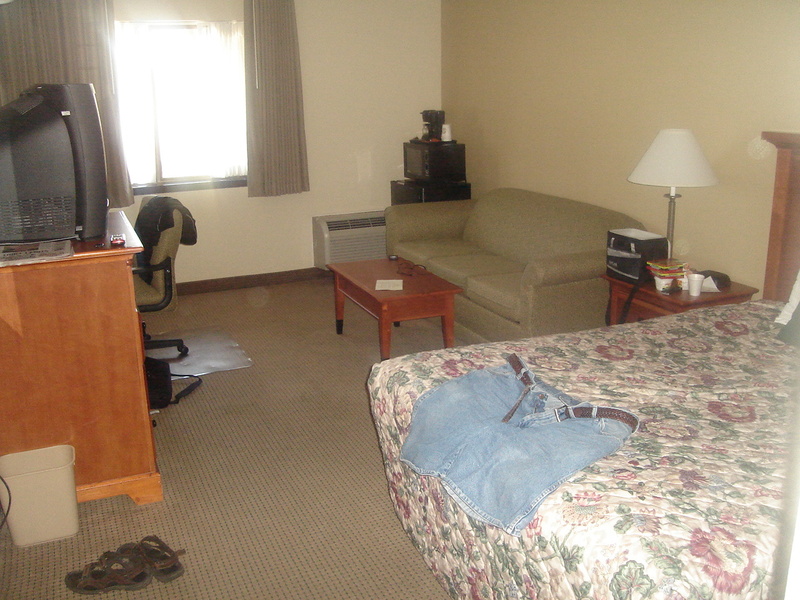 LOVIN THE HOTEL: For the second time in less that two weeks, I have set up shop at the Best Western Ahtanum Inn in Yakima (my room pictured to the right). Although many of the hotels in the league are newer – they do not have the charm and personality of this mom-and-pop hotel. The people are really friendly from the front desk staff to the cleaning staff, the room is tidely and clean, and as my son enjoyed the last trip through, they have a great courtyard and pool for everyone to use. BEST OF COMING UP: Just as I talked about on Hawk Talk tonight, we will be starting a “Best of the NWL” segment on the blog in the days to come. Best Stadium, Best Mascot, Best Food, Best Hotel, Best Press Box…but is there anything from the road that you want Best Of? Respond to the blog or email me at boisehawks@yahoo.com and we can try and answer your request.